Municipal by-laws, permits, statements of offence, claims, municipal court. Community directory, universal accessibility, studying in Montréal. Water, air, soil, residual materials, natural environments, climate change, pesticides. Practical information about your tax bill, laws and regulations, housing assistance programs. Household waste, recycling, cleanliness, towing, snow removal. Emergency services, neighbourhood police, firefighters, food inspection. Transportation plan, major projects, public transit, information for motorists. City's department, organizations and advisory boards. Seasonal activities, sports facilities, parks and gardens. Resources, taxes, permits and regulations. Learn more about your elected officials. Tours of the hall of honour, exhibitions and information about Montréal's flag and coat of arms. Don't know the name of your borough? Enter your postal code. 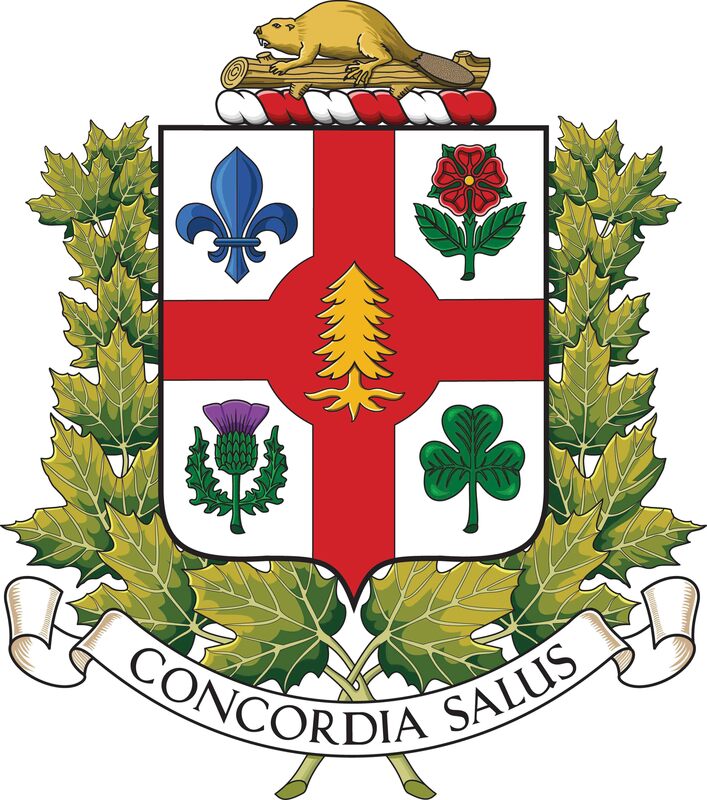 The Montréal coat of arms was adopted in 1833 by the city councillors of the time. It was modified 105 years later to ensure compliance with heraldry’s high standards. In fact, this crest was the only city emblem until 1981 when a stylized logo was developed. 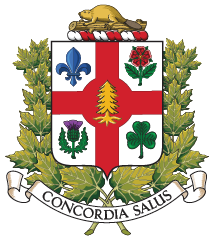 Both the coat of arms and logo now represent Montréal, although traditionally, the crest is reserved for special uses. Montréal has changed is coat of arms and flag to better reflect the city’s origins, establish a “nation-to-nation” relationship with Indigenous Peoples and recognize their importance and fundamental historical contribution. On September 13, 2017, as we celebrate the 10th anniversary of the United Nations Declaration on the Rights of Indigenous Peoples, Montréal presents its new coat of arms and flag with a white pine symbolizing the Indigenous Peoples, and standing for Peace and Harmony. The white pine now appears alongside the other emblems on the city’s coat of arms, spotlighting Montréal’s five founding peoples. It is in the centre of a circle open at the four compass points, representing the Circle of Life and the council fire—a place for meeting and dialogue. The city’s new coat of arms now reflects the five peoples who are at the origin of our metropolis’s history and development. They are the First Nations, the French, the English, the Scottish and the Irish. Form of shield — Following the example of the province, Montréal, whose history and beginnings are identical to it, has adopted the French form of shield. The field — The field is silver to recall the old coat of arms which was created by the first mayor of Montréal, Jacques Viger. Heraldic cross — The heraldic cross is emblematic of the Christian motives and principles which governed the founders of the city. 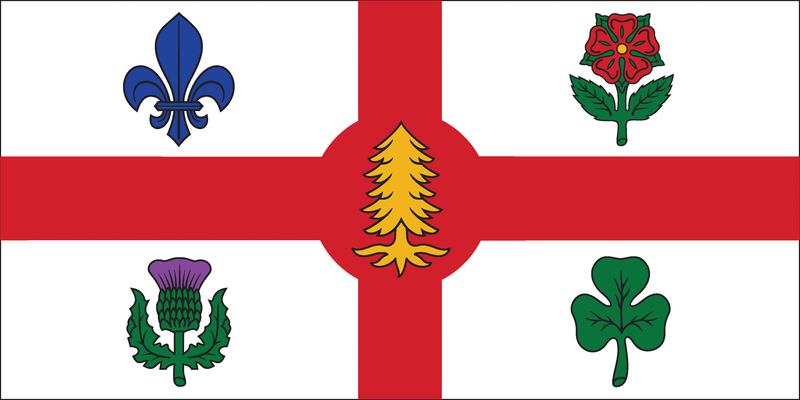 National emblems — The field is quartered to contain four floral designs each of which represents the ethnic origin of the Montréal population in the 19th century. 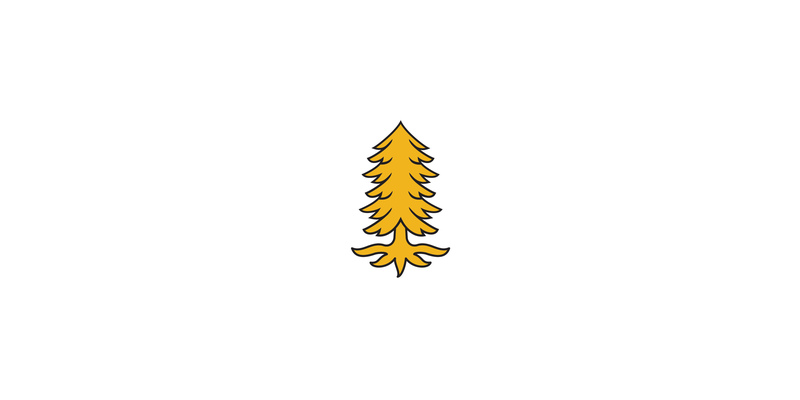 The white pine stands for the original native presence in Montréal. The fleur-de-lys of the Royal House of Bourbon represents the French. The rose of the House of Lancaster symbolizes the English. The thistle stands for the Scottish. The clover is for the Irish. The city’s new coat of arms preserves the key elements of its former version, plus the pine symbol. The Latin motto Concordia Salus (Salvation through harmony) remains, along with the maple leaves and beaver. The device on the scroll — The motto "CONCORDIA SALUS," salvation through harmony, is inscribed on the scroll below the crest. This arrangement is also the same as on the arms of the province of Québec arms. The maple leaves — Montréal's coat of arms, like that of Québec, is surrounded by a wreath of maple leaves. They are the leaves of the sugar maple (Acer saccharum) and they symbolize the amicable relations between the various elements of the city's population. The beaver — Mounted over the shield is a beaver representing the industriousness of Montrealers who have worked to develop our city. The city flag was first displayed in May 1939. 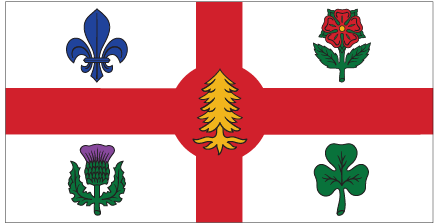 The flag is blazoned with the same heraldic symbols as those of the coat of arms: the heraldic cross gules against a white background and the four iconic flowers in the white rectangles, with the white pine in the centre. The flag is twice as broad as it is long. By tradition, old flags are retired in a dignified way, by burning. The new flag will soon be available in different sizes at the Centre de distribution Colbert. The city adopted its official logo (in French) and visual identification program in 1981 and the mandate to create them was awarded to the graphic design firm Georges Huel et Associés Inc. The logo was created to show the city’s dynamism and to promote communication with Montréalers as well as its image on the national and international scenes. The emblem, which takes its inspiration from the city’s coat of arms, is a minimalist logo that is shaped like a flower, in which each petal forms the letters V and M, the initials for “Ville de Montréal.” The intersecting lines at the centre of the logo symbolize the city’s vocation as a crossroads of communication and civilization. The four heart-shaped petals signify the deep attachment Montréalers have to their city. An undulating line encircles the whole, representing the island, while the intertwining of plant and aquatic symbolism expresses the wealth of Montréal’s natural environment and the care Montréalers take to preserve it. The rosette will be maintained and placed to the right of the word “Montréal,” following the same design scheme as the government logos of Québec and Canada, whose names appear alone (without the word government) with a visual element placed to the right.